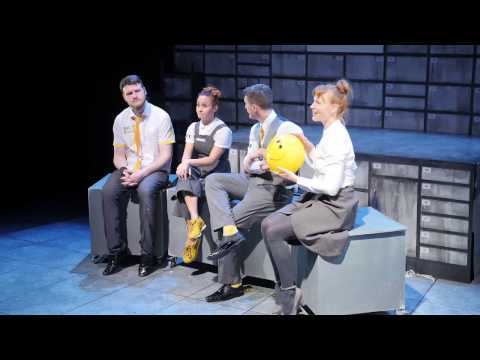 Following a successful National tour in 2015 of That’s Amore (“Like a Richard Curtis romcom reworked by DV8, glorious and full of heart” – Guardian), Tmesis Theatre brings you Happy Hour. This poignant, fast paced comedy exploring our 21st century obsession with happiness and success combines Tmesis’ trademark physicality with humour, music, and text from long-term collaborator Chris Fittock. Tmesis Theatre, based in Liverpool, is one of the UK’s leading physical theatre companies, with a reach that is national and international. The company produce and tour shows, deliver workshops and outreach work and run Liverpool’s annual international physical theatre festival, Physical Fest. Tmesis Theatre’s artists believe in challenging themselves and continuing to push for exciting, innovative collaborations and work of a high quality. Producing all that is good in the world of physical theatre.